The following reflection by Breanna Reynolds is part of a series of blog posts written by THINK Global School faculty members to showcase their thoughts and experiences from a recent weXplore trip to Washington D.C. To view the entire conversation, visit us on Spot. 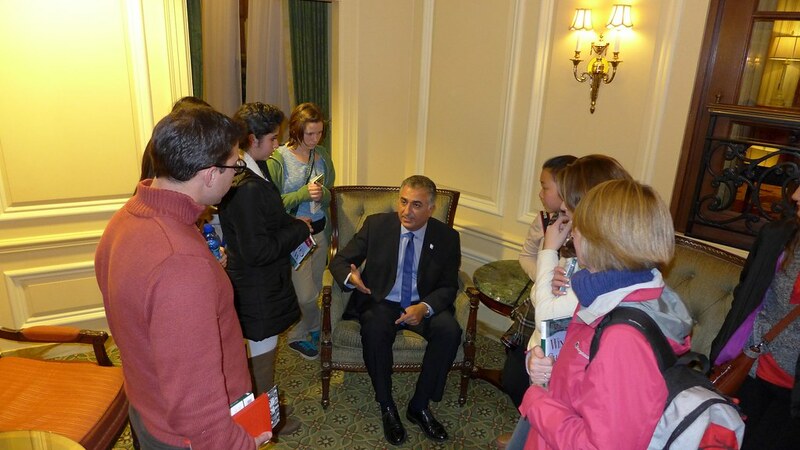 Prince Reza Pahlavi, Shah of Iran, graced THINK Global School with a visit to Washington DC this week. His powerful oration on the political instability of his country left me contemplating development issues around the world, such as poverty, radicalism, corruption, and war. I admire my students for so many reasons, but on this occasion in particular, I admired their desire to make the world a better place. Student after student questioned Pahlavi and asked what role they could play in contributing to a more united and peaceful global community. Pahlavi encouraged their advocacy for non-violence, communication, education, and empowerment for all. He left the students thinking about his biggest worry for the future, something he calls the “Syndrome of the Silent Majority.” Pahlavi read the words of revolutionary leaders such as Gandhi and Martin Luther King Jr., while repeating that WAR is not the answer and that non-violent communication will restore the people’s power. The students recognized that through educating and empowering people, change is attainable. Even though the world’s problems are daunting and overwhelming to tackle, we know we have 34 students willing and ready to try. At THINK Global School, we are not a part of a silent majority. Instead we are a part of something extraordinary, and our discussion with Prince Pahlavi reminded us of that.